What’s been cooking in Cozumel Chef’s Kitchen? 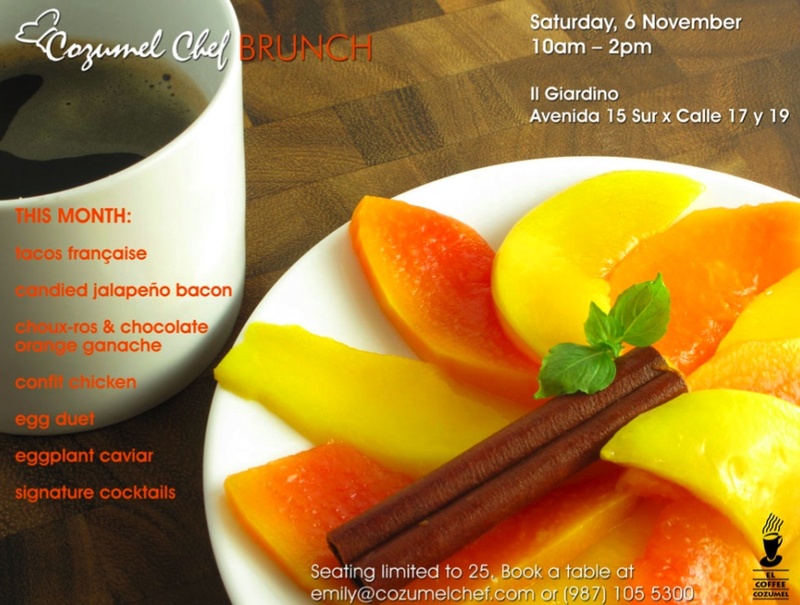 The launch of Cozumel Chef Brunch, that’s what! Working diligently in the kitchen, the chef teased us with some of her ideas on Facebook. Finally, after months of thoughtful planning, kitchen testing (and tasting) and many menu revisions, the chef successfully hosted an exclusive brunch event in the gardens ofdens of Il Giardino, one of Cozumel’s finest Cocina Economicas. Maria, the chef and owner of Il Giardino, was proud to introduce the Cozumel Chef and her food to friends and local island dwellers. The kitchen opened its doors on November 6th at 10am to a refreshing, cool Cozumel fall day (the chef and guests could not have asked for a better day for a delightful meal to be served)..
To start the meal, each guest was presented with an amuse bouche of a sherry-infused gazpacho soup. Following this refreshing pallet teaser, guests selected from a choice of three composed entrées and a variety of “brunch snacks” (tasty treats to stimulate the palette). Highlights included the “tacos française,” traditional sweet crepes served with tangy mango; ginger, mint and papaya marmalade; and crème fraiche along with rum-poached papaya. Also, the “choux-ros,” served with burnt-orange chocolate ganache, was a massive crowd pleaser (with guests some ordering seconds). For the full brunch menu that was served, please see the chef’s Flickr album. In addition to the menu, drinks and cocktails were served. Guests enjoyed freshly-made white wine sangria as well as other select breakfast beverages. The chef was also proud to sponsor freshly roasted coffee from El Coffee Cozumel, her favorite local coffee shop (and office of the chef when she is not in the kitchen). While the chef cooked up her menu, it could not have been served without the support of her leading man (and front of the house of Cozumel Chef) Pawel, along with his friend Alex. Pawel and Alex warmly greeted and served all guests of Cozumel Chef Brunch. Many thanks to the hard work of theses gentleman, as well as to Maria and her friend Lulu.. So what’s in store for the next brunch? Well, the chef is looking forward to introducing a tasting menu. Some ideas: mini dragon fruit muffins, cherry-tomato confit frittata served with spicy bacon-potato hash and much more!